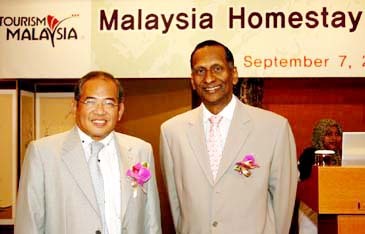 As Part of "Visit Malaysia Year 2007"
Director Abdul Mutalib Awang (8th from left) of Tourism Malaysia Seoul poses with Malaysian Ambassador to Seoul Dato' M. Santhananaban (10th from left), and with others in Malaysia Homestay seminar held in Seoul on Sept. 7, 2006. 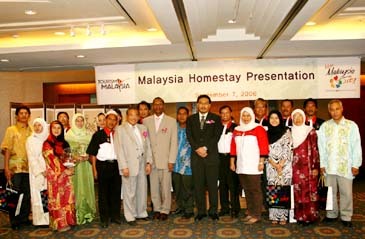 Director Abdul Mutalib Awang of Tourism Malaysia Seoul hosted a seminar to introduce "Homestay Malaysia" program at the Lotte Hotel in downtown Seoul on Sept. 7, 2006. More than 100 people from the local travel industry took part in the seminar which included a luncheon. Scores of local media including The Seoul Times attended the seminar. Director Awang gave an opening speech, which was followed by a welcoming address by Malaysian Ambassador to Seoul Dato' M. Santhananaban. The "Homestay Malaysia" seminar was one of the major events in which the authentic cultural experience of Malaysia was introduced to the local media and tourism industry. The "Homestay Malaysia" offers a variety of programs including visiting schools and farms, eco-tourism, making handcrafts, traditional cooking class, traditional plays and martial arts, and English lessons. Annually, about 50,000 people from around the world visit Malaysia for the "Homestay Malaysia" program. Director Abdul Mutalib Awang (left) of Tourism Malaysia Seoul poses with Malaysian Ambassador to Seoul Dato' M. Santhananaban in Malaysia Homestay seminar in Seoul. In the seminar Mr. Haji Sahariman Hamdan, chairman of Homestay Malaysia Association, said that he would introduce the program to the general public including college students as well as industry people. The "Homestay Malaysia" seminar was held as part of a nation-wide drive for promoting tourism in Malaysia. Dubbed as "Visit Malaysia Year 2007(VMY2007)" Malaysia's efforts for tour promotion is fully implemented and supported by the Philippine Department of Tourism (DOT) and Malaysia Tourism Promotion Board (MTPB). Malaysia already declared the year 2007 "Visit Malaysia Year 2007(VMY2007)" and DOT is all out with its campaign catchphrase of "Malaysia Welcomes the World." In August, 2007 Malaysia will show various events including performances, street show, and carnival on the occasion of its independence "Merdeka Day." The year 2007 is the 50th anniversary of Malaysia's independence from its former colonial ruler of Great Britain.